*I used two colors of twine to wrap around the neck of my candle and make that big, beautiful bow - Cranberry Twine and In The Navy Twine. Aren't they gorgeous together? 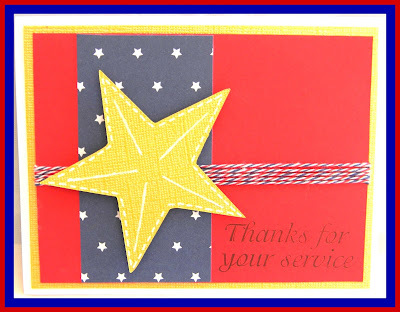 * Using my Silhouette, I cut out a few stars in red and white cardstock. I covered them in glitter and glued them to the bottom of the twine on my candle. *I punched a few holes around the top of a plain white gift bag and threaded my twine through the holes. I tied a big pretty bow off to one side of the bag. *Next, I glued on a few of my glitter stars and a fun sentiment and it's all finished! I hope you've enjoyed my project today! Thanks again to all the wonderful Trendy Twine Ladies! I've enjoyed being your Guest Designer this month! If you didn't know we have a New Store, check out , HERE Also don't forget to join the Trendy Twine Group in Facebook, this is where we announce our NEW Colors that are coming soon! Helen here from HTB Creations today. 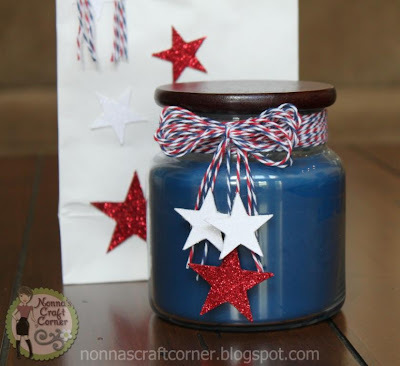 I have a fun 4th of July bucket for you. I saw this idea on Pick Your Plum and had just the right colors of Washi Tape to pull it off along with the perfect twine for it -- Stars & Stripes Trendy Twine! It is pretty easy to make, but it does take a bit of patience to get the washi to stay straight. You just need to rub out any bubbles that might pop up. On the top twine, I just glued down the beginning and the end. But on the bottom, it wasn't staying very well so I used a bit more glue throughout the process. To finish it off, I really felt like it needed those pretty silver star sequins! Happy Trendy Tuesday, Twiners! It's Jessi here from Kissin' Krafts! 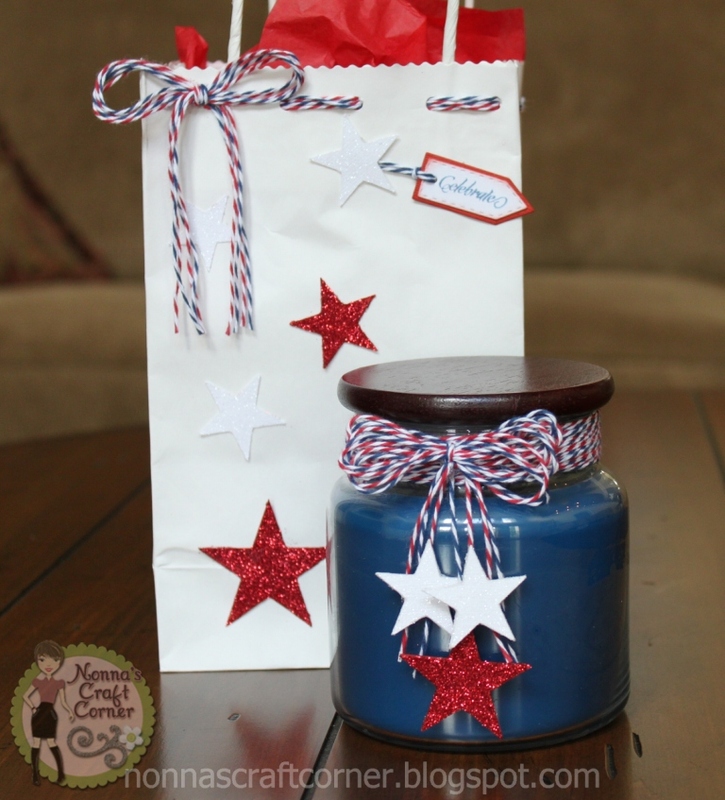 I hope you have been enjoying this month's spotlight color - Stars & Stripes! I am in love with this twine the color combo is perfect for so many holidays! And of course, the Fourth of July! Today I am sharing a very simple and easy to make treat bag! Perfect for the upcoming Fourth of July parties/picnics! 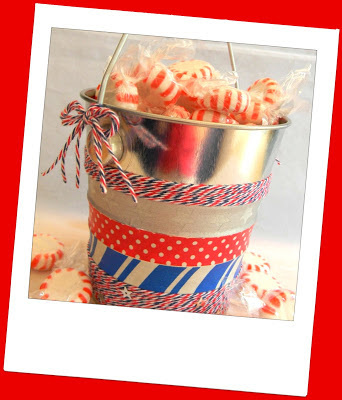 It all starts with a canvas treat bag (available HERE in the Trendy Twine Store), needle and Trendy Twine's Stars & Stripes. Stitch a large star on the front of the bag. I thought it looked better with the star off-centered. Once the star is complete, I stitched a large button using Trendy Twine's Totally White. 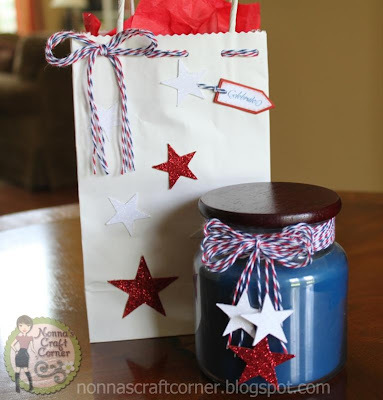 To finish the bag, I stamped a festive tag and tied off with more Stars & Stripes! Thank you for stopping by today! Looking for more Trendy Twine inspiration? Like our Facebook page and join our Twine It Up Facebook group! 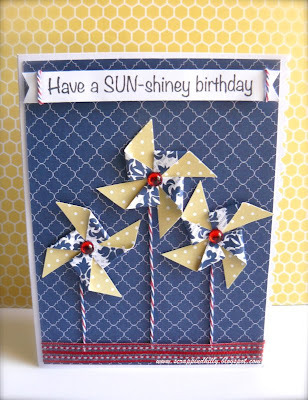 My friend's birthday is next week so I thought it would be fun to create a card for her using patriotic colors. Summer reminds me of pinwheels so I used a tutorial on Pinterest to make these. 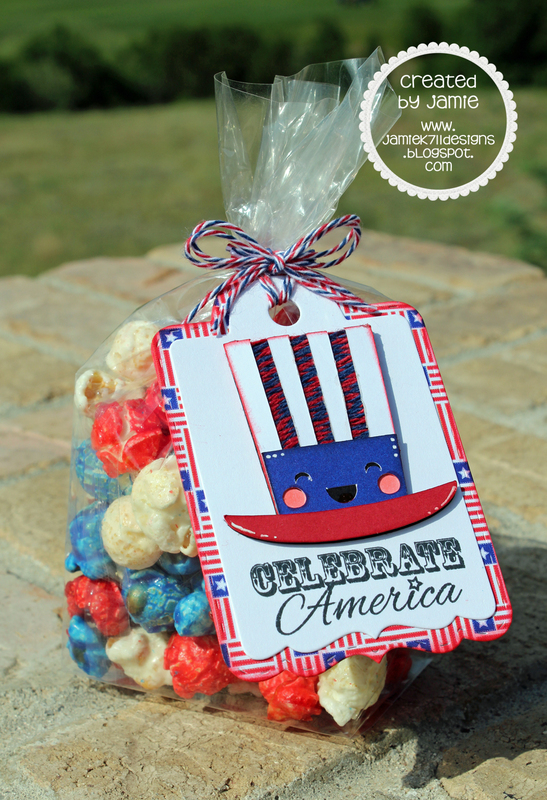 I just love the red, white and blue colors with the pop of yellow! I added some Stars and Stripes Trendy Twine to the pinwheels and attached some ribbon to the bottom of the card. 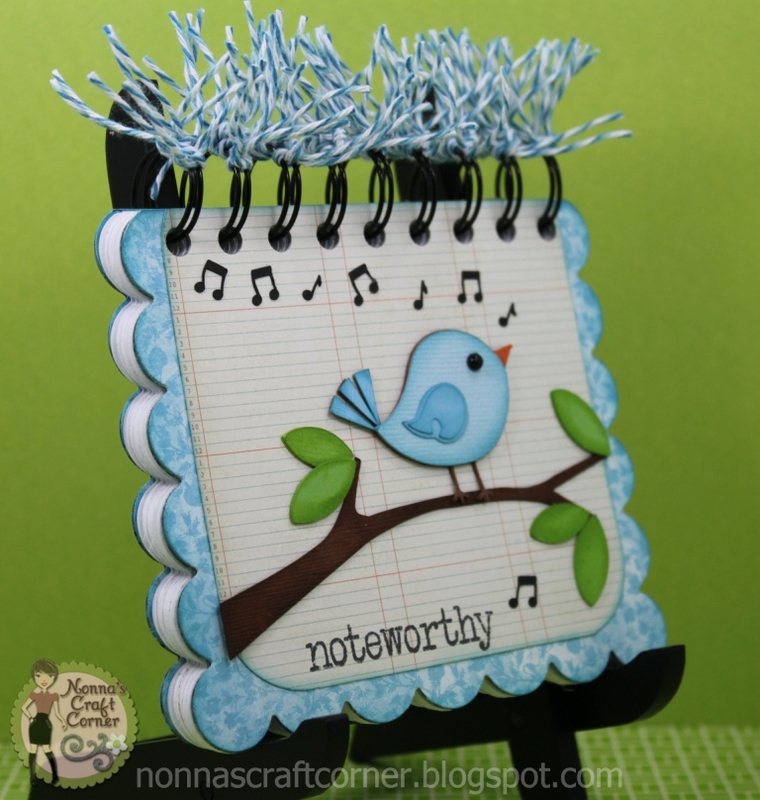 A fun sentiment from Docerela Stamps finished off the card. For more project information, please stop by my blog. All of these fabulous colors are on sale, so stop by and check out the store. Plus, there is a sneak peek of the newest color available on July 4th, you won't want to miss it! 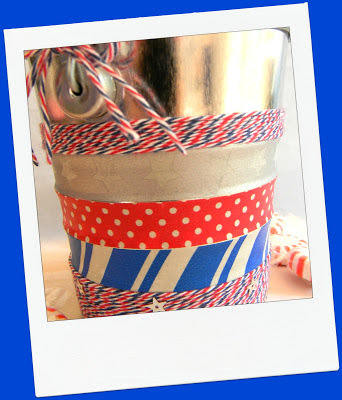 Jamie here and I've got a new Trendy Twine project to share with you today! 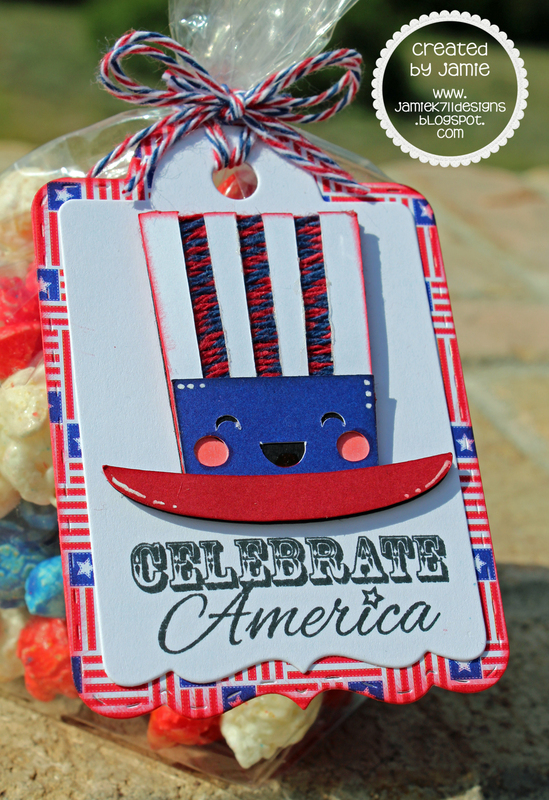 Today I used Stars & Stripes and Berries Jubilee.... both are on sale this month HERE. I found this popcorn at Target. I used a cute Patriotic Hat file and made the stripes with some Berries Jubilee. Here's a close up of the tag, stamped with a Jaded Blossom sentiment. I attached the tag with some Stars & Stripes. Hello everyone! This is Tanya from Nonna's Craft Corner bringing you my second project as this month's Guest Designer here at Trendy Twine! 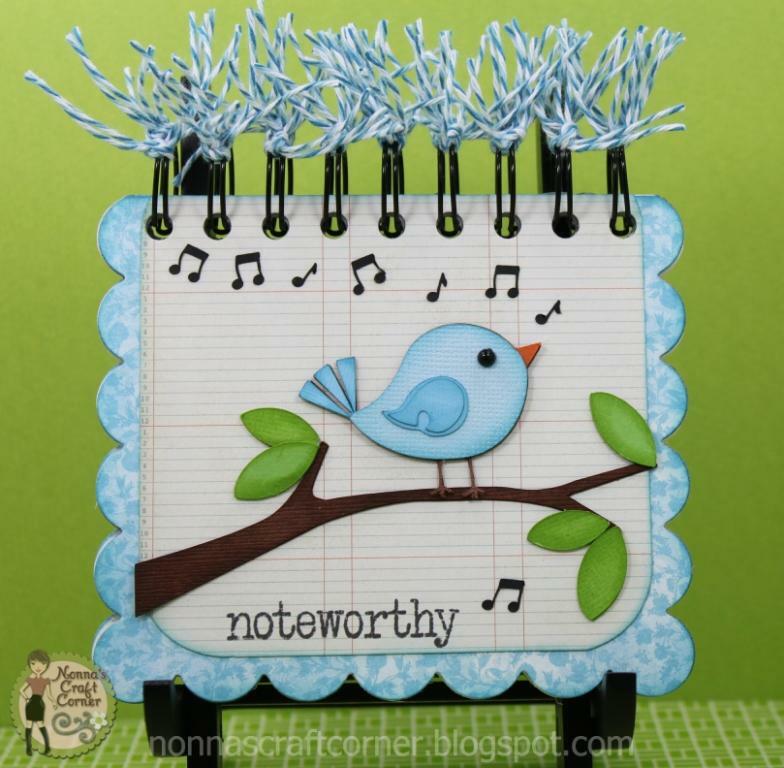 * I decorated my front cover with the cute little bird and musical notes that I cut out with my Cameo. * After decorating my cover, I bound the covers and inside pages together using my Cinch. * Next, I cut several pieces of Blue Berry Twine about 5 - 6 inches long. Taking 2 strands at a time, I tied them around each wire. I repeated the process 2 more times, giving each wire 6 strands of twine total for a nice, full look. * After tying on all the twine, I trimmed off the ends for a nice, even appearance. 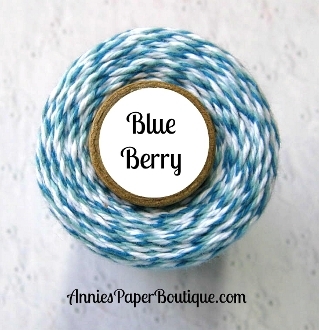 I totally adore the beautiful mix of blues in this Blue Berry Twine! So pretty! Well, that's about it for me today! Thanks so much for stopping by. I'll be back with one more project to share with you on Friday, June 28th. I hope to see you then! 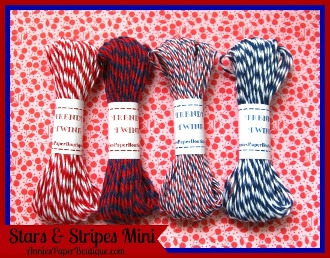 This has got to be one of my favorite colors, a twist of red, white, and blue...Perfect for all those patriotic projects! And if you are a blog follower of mine, you know I have been making quite a few projects over the last month using this twist. Flag Day is on Friday and I thought I would celebrate by making a fun little treat bag using the super adorable Tiny Clear Flat Bottom Lunch Bags that you can pick up in the Trendy Twine store. They are the perfect size to hold lots of treats...in my case I ended up filling it with some salt water taffy. There are 6 pieces in this bag but there is plenty of room to add double that! Aother the great thing about these clear bags is you can add so many different treats to them and embellish them is a variety of different ways!! The possibilities are endless! Well I sure hope you have enjoyed my project! Make sure to check out the Stars and Stripes Trendy Twine along with these other awesome colors..... all on sale for the month of June! You can see them all HERE at the store! I was asked to do a card demo in July and my mother-in-law took some of my cards to show the ladies. One of them asked that I make cards for her to send to a troop for the June package she is sending. I spent an entire Saturday trying to come up with something and this is what I ended up with. Sorry the picture is not exactly the best. It was cloudy and now the cards are on their way. 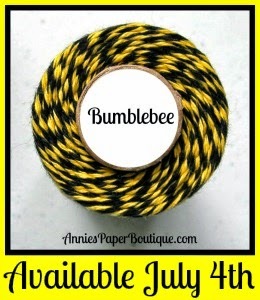 This twine is perfect for July, so don't wait, get yours now! It on sale along with some other great colors for the 4th. There is even a mini special so you can try all 4 colors out. Hello Trendy Twine fans, today I have a 2 page 12x12 layout to share. 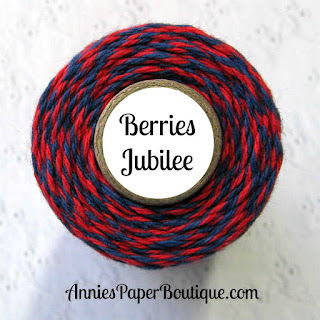 I used a vibrant color scheme to go along with Berries Jubilee which is one of the featured colors this month. 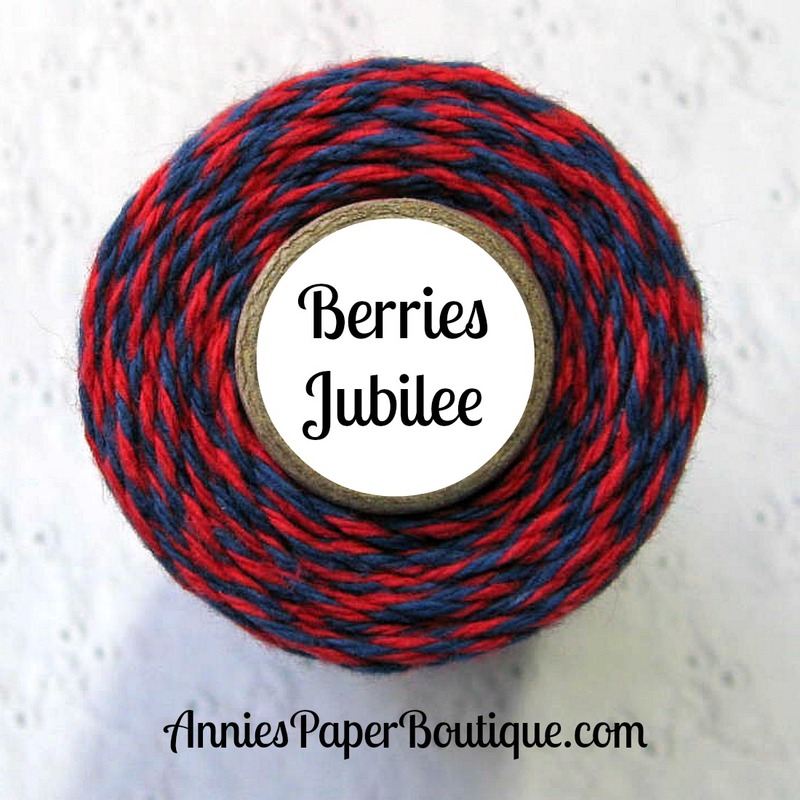 This twine is a gorgeous twist of navy and red and can be used for festive or everyday projects. I used the twine to accent the die cuts on my layout. If you would like a closer look at my project, please stop by my blog to check it out. Also check out all of the featured colors for this month, they are all on sale too! 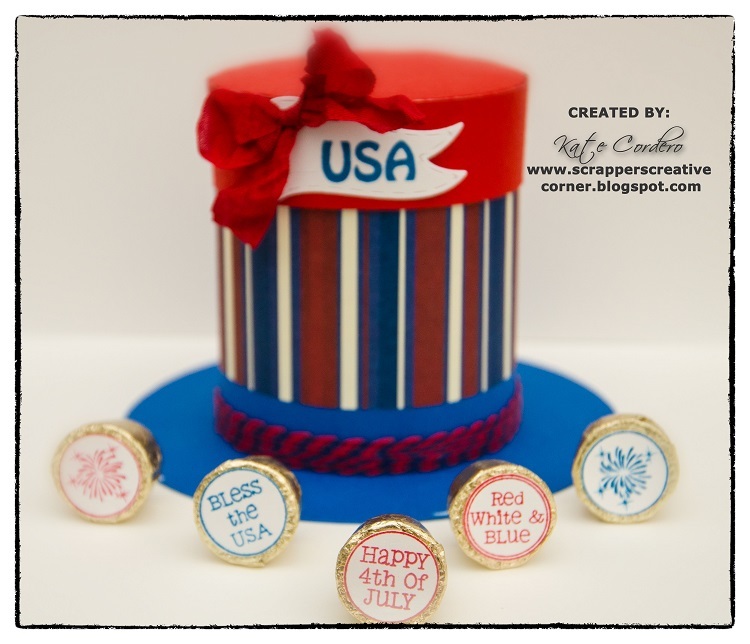 I love the red, white and blue color combinations, aren't they just gorgeous? All of these colors plus many other products are available in the new store. Thanks for stopping by and have a great Monday! Hello everyone! 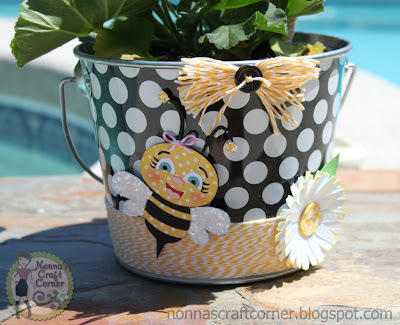 This is Tanya from Nonna's Craft Corner and I am so excited to be the Guest Designer for the month of June here at Twine it up with Trendy Twine! Thanks so much to Lesley and the Design Team Members for having me over to play! I came across this fun black and white polka dot bucket and thought it really need a punch of yellow to bring it to life. So, I got out my beautiful Lemon Tart Twine and got busy! Starting at the bottom of my bucket, I wrapped my twine around the bucket going up about 3 inches. I used dots of Glossy Accents along the way to hold my twine in place. 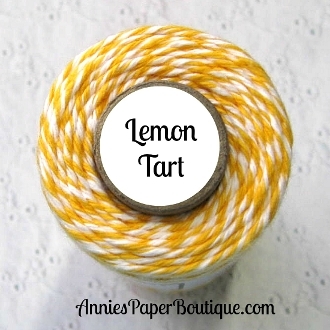 I also created a fun accent piece by wrapping Lemon Tart twine around a 3 inch piece of cardstock several times. I slid the twine off and tied it in the center with a short piece of twine, then trimmed off the end pieces. I added a black button to the center and glued it into place at the top of my bucket using a hot glue gun. And there you go...a special thank you gift for a special friend! Isn't it pretty?....and just perfect for summer! Well, that's all I have for today. I hope you enjoyed my project and I look forward to sharing another fun Trendy Twine project with you next Friday! and it is on sale all month! 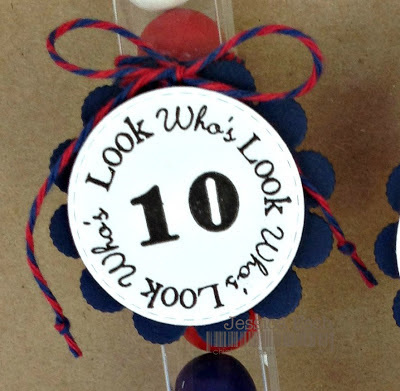 I am getting a jump start on my son's 10th birthday party and and wanted to make a cute treat that he could give to some of his party guests. He is a HUGE bubble gum lover so my project is right up his alley! We always tend to forget that sometimes simple can really make a great project and I hope you agree that this is one of them! 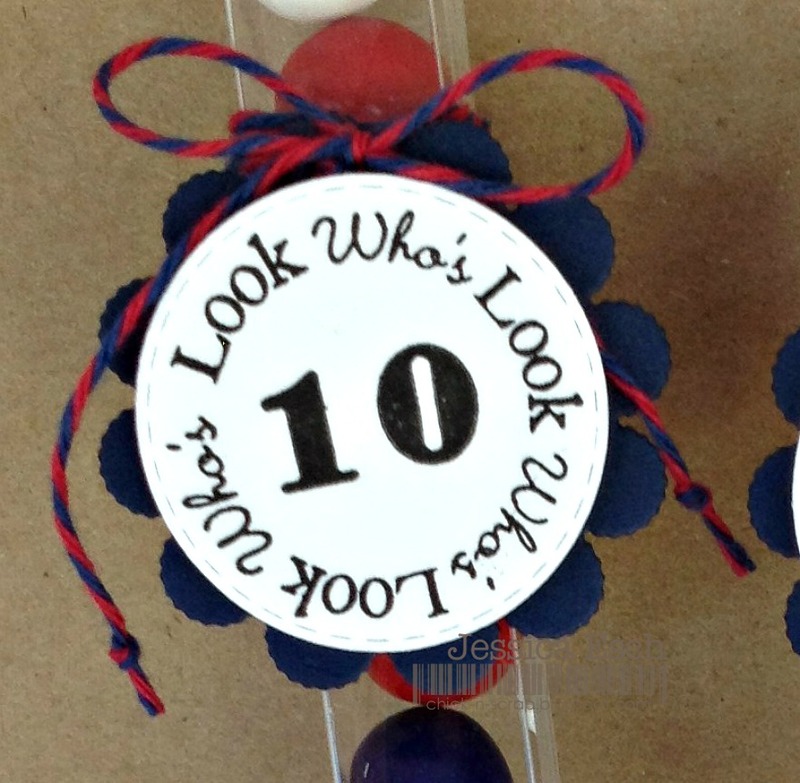 and filled them with some Red/White and Blue gumballs. These boxes are PERFECT for holding the small bulk gumballs and jackpot for the kids because I only picked out the colors I wanted for my project and the rest they get! Next for my sentiment I used My Creative Time~Scallop and Stitched Circle Dies along with the All Around Birthday Time stamp set and added them to white and navy card stock. I punched a small hole in the scalloped die cut, popped up the circle to add more dimension and it was ready to be added to my clear box. I then wrapped my Berries Jubilee Trendy Twine several times around the clear box and added my sentiment tag tied with a big bow. So here is what they look like.....Fun project right??? And very easy to make! The great thing about these clear boxes is you can add so many different treats to them and embellish them is a variety of different ways!! So what do you think??? My son already wanted to dig into one....but he has to wait until Monday...on his birthday! Well I sure hope you have enjoyed my project! Make sure to check out the Berries Jubilee along with these other awesome colors..... all on sale for the month of June! Good morning, Trendy Twiners! It's Jessi from Kissin' Krafts! 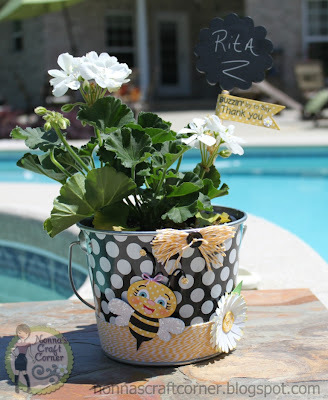 (Hop on over to see my Trendy Twine Giveaway!!) Have you enjoyed the summer weather yet, and brought out the (dreaded) swimsuit? I have yet to dust off mine, putting it off as long as possible! Although, my mind might change with this fun summer card! 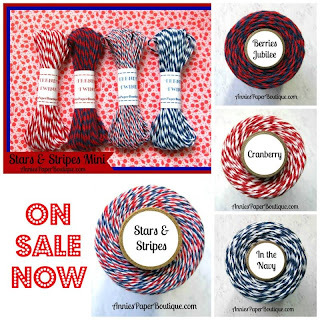 Stars and Stripes is one of my favorite Trendy Twine colors available! The color combo is PERFECT! So many wonderful possibilities available! Today I took the simple approach and created a twine clothesline. The beach background is created by blending inks. To add a special beachy touch, I took some beach stamps and repeated the images throughout the sand. Stop by our new store to see the awesome prices! Check out our Trendy Twine Facebook to see the latest Trendy Twine news! 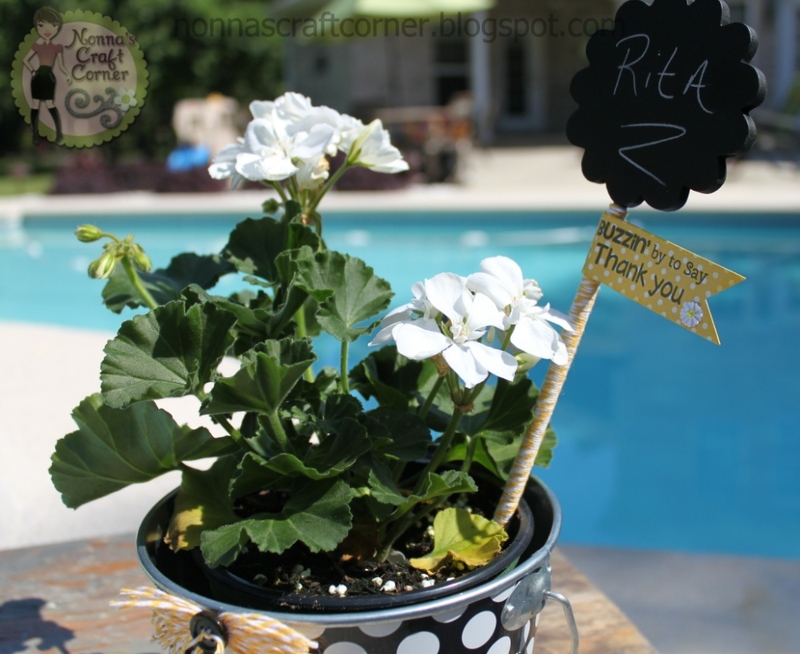 Don't forget to check out my Trendy Twine Giveaway on my blog! Last month our challenge was "Get Krafty" and we had some awesome entries. We get a kick out of seeing all the different projects. A big thank you to all of you who play along with us. For the month of June, the Design Team is changing up a bit so we aren't going to have a challenge. 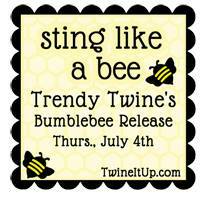 Please join us next month for our "Sting Like a Bee" Challenge. Donna K from Created by Donna K.
She created a darling snail mail card. If you didn't see it, click on the link above. until Monday, June 17th, to use your coupon. 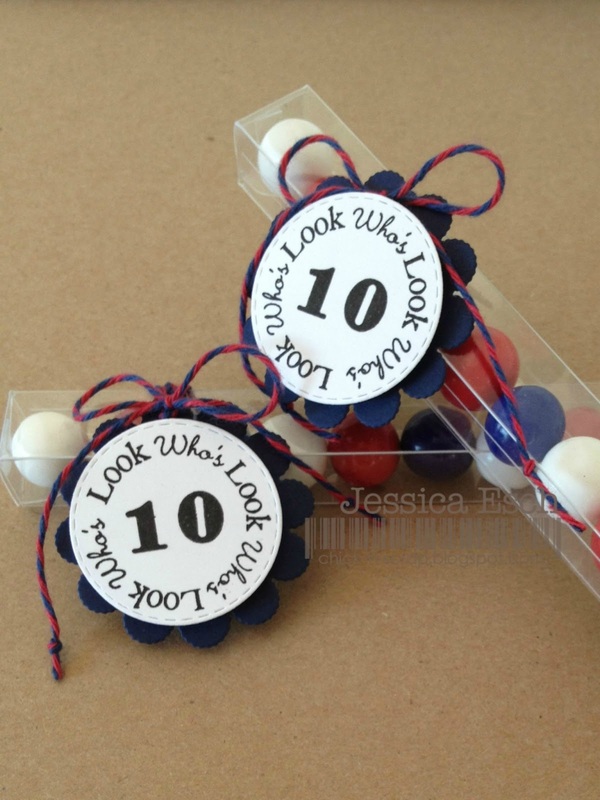 These are perfect for your patriotic crafting.